Our Lavender hanging hearts make a great addition to any home whether you are searching for a gift for someone else or yourself! Each one is hand made in the Mutts & Hounds studio and filled with wonderfully scented English lavender. Made with British textile designer, Emily Bond's rustic printed linens. These gorgeous lavender hearts are made from a selection of beautiful fabrics including dog printed linens and quality Yorkshire tweeds. They also come in two organic ticking fabrics, one in cranberry red and the other in misty blue. Stuffed with classic English lavender, they make the perfect gift for any dog lover and will look great in any home. 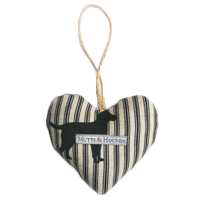 Every lavender heart is exclusively handmade by the wonderful Mutts and Hounds in the UK.